Think you’ve got problems? Right now, Tara Simmons doesn’t have eyebrows. Perhaps it’s a bit crass to reduce a cancer diagnosis to such a seemingly dismissive opening to her first new biography in five years, but that’s just Tara in a nutshell. She’s already been through it all - wept it all out, wrestled her perceived mortality and emerged with a whole lot of new perspective. And a hunger to make music again. A quick five years has slipped by since her last releases - a prolific stream of singles, EPs and albums that all served the ambitious writer, producer and musician significantly. But the experimental Tara, always in motion, could not and would not sit still, instead pushing against her natural pop sensibilities and opting for an alternate moniker that both stood out and fit in. Naturally, the project called CastleRays fashioned its own momentum - she toured as frontwoman and vocalist for electronic outfit YesYou and extended her live chops guesting on many a big stage alongside festival mainstays RUFUS. Meanwhile she watched material from her back catalogue take on a life of their own, garnering international radio play and solid television placements that would open the door to new followers. Naturally, the Tara Simmons sound of old - string-driven pop experimentation with field samples - started to creep back into her subconscious. Next a metamorphosis occurred, and while she didn’t have eyebrows or a single hair on her head, Tara was happier. Her friends rallied around her in a way only tragedy can encourage and the music started to flow.. She regrouped with her longtime collaborator Yanto Browning to see where some writing would take them. ‘Achromatopsia’ was the first song Tara began work on and the first the pair finished. It quickly recalls the astute production values of The Postal Service with an upshot that falls somewhere between contemporaries like Sylvan Esso and even St. Vincent. Her trademark, breeze-tinged vocal, almost at risk of being too damn flawless, succeeds in surviving the years of transformation. Aside from a last minute, surprise studio encounter with a string quartet, Simmons and Browning wrote, produced and played everything on the recording, but even those strings parts were written by Tara mere moments before recording began - a tip of the hat, perhaps, to her early career in which cellos were a part of her touring band. But the thing she loves most about this song is that it pulls together two of her great loves - art and the brain. With a condition such as this, most might go into a tailspin of sadness - not Tara. She’s foregoing melancholy for music, ambition and her art is prevailing with an immediate future largely involving building upon her legacy. That’s what makes ‘Achromatopsia’ and what’s to come such a step forward for her: there’s a new sense of ambition from within, an artist with nothing to lose. Having taken a masterful journey so far, Tara is more equipped than ever before to take the world by the horns. CastleRays is the new electronic duo comprised of Tara Simmons & accomplished producer Yanto Browning. Originally a side project dreamed up by Simmons while touring and writing with national party-starting behemoths YesYou, CastleRays has undergone a metamorphosis of sorts, changing shape to include Browning. CastleRays’ ethereal first track ‘Body Hum’ was a result of Simmons and YesYou “messing around” with collaborative writing; and enjoyed rapturous reception as a temporary inclusion in YesYou’s live set. To Simmons, it was already clear that CastleRays would be more than a fleeting moment – that there was something there. After discovering the professional synchronicity between Browning & Simmons while the former was producing the latter’s most recent album under her own name, ‘It’s Not Like We’re Trying To Move Mountains’, the path forward became clear. CastleRays as it exists today was born, built on the unshakeable foundations of a pre-existing friendship and a mutual desire to create something new. Under her own name, Tara Simmons was entirely self-produced until ‘Mountains’. Having previously been tipped by triple j as part of the Next Crop, ‘Be Gone’, the first single released as a result of her collaboration with Browning, was added to full rotation by the national youth broadcaster. 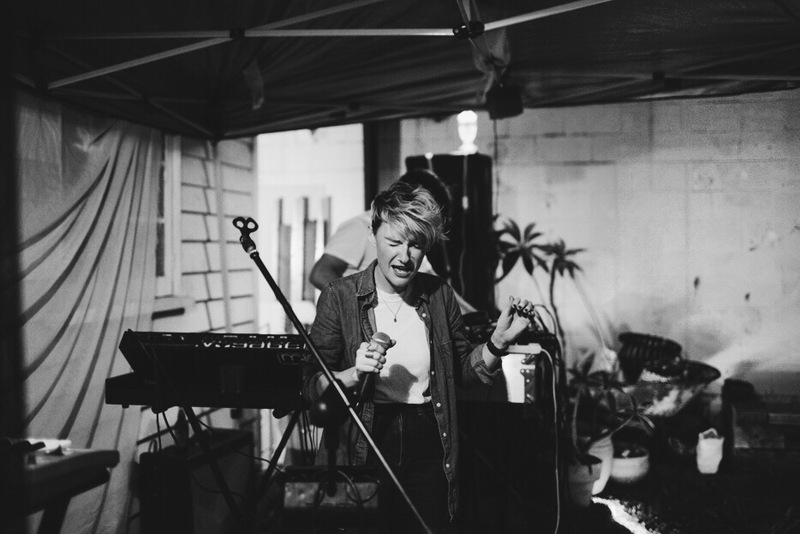 Simmons’ music has been used extensively in television both nationally and in the US, and she’s clocked up quite the impressive live resume, supporting the likes of Eskimo Joe, School Of Seven Bells, Elizabeth Rose, Hungry Kids of Hungary, Kate Miller-Heidke and many more. Browning’s accolades need no rehashing to anyone who’s been paying attention to Australian music. He’s produced for the likes of Art of Sleeping, The Belligerents, Kate Miller-Heidke, The Jungle Giants, Fox & Fowl, and countless other acts. But he’s also a musician in his own right – he’s composed & produced for film, television and theatre; as well as having performed at festivals such as Splendour in the Grass & Big Day Out, and toured nationally with singer/songwriter Jac Stone. There’s no question – together, Simmons & Browning are a force to be reckoned with. The pair have a distinctive vision for CastleRays in this new form: infectious electronica, but with a darker twist. Their own styles crashing into one another to create something inky and undeniable. Something irresistible.